Don't let the inhospitable winters of Northern Virginia keep you from enjoying the outdoors. 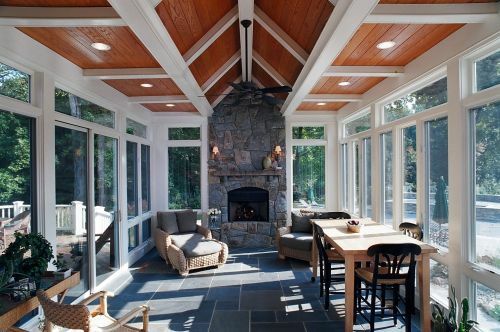 Sunrooms allow you to enjoy the outdoors all year long. Let Berriz Design Build Group design and construct a beautiful four-seasons sunroom addition for your home. Sunroom additions invite the beauty of the landscape surrounding your home indoors, letting the scenery act as the backdrop for this room that can serve almost any purpose. Add a sunroom in order to enlarge a kitchen, adding both space and sunlight; or create a spa-like retreat by adding a sunroom to enclose the area around your pool. You can read more about the benefits of a Modernize sunroom here. Browse our online portfolio and contact us for a consultation today. If you are looking for a Sunrooms design and build contractor in Northern Virginia, please call Berriz Design Build Group at 703-552-7565 or complete our online request form.